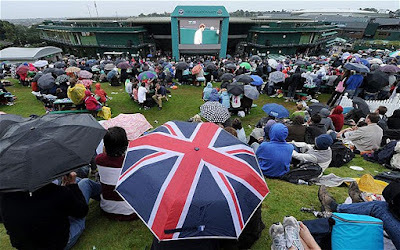 It's that time of year, all eyes on the green grass courts of Wimbledon, and all ears on the horrible mispronunciation of the name by American broadcast journalists. "Can they not hear the D? There's a 'd' in Wimbledon, mate. Not a bloody 't'. It's Wim-Bull-Dun, not WimbleTon!!" I've never been to Wimbledon; I go back and forth—like a tennis ball—about putting it on my bucket list. I was even in England once during the Wimbledon tourney but I never got closer to it than the screen on my grandmother's television set, watching it with her from her Chorleywood home, her beautiful garden filled with roses and brick pathways and arches that my uncle built himself, through the garden door behind us. For years I watched the two week tournament at home here in California via NBC's Breakfast at Wimbledon. Bouncing round every year in late June, early July, like the end of the school year, the opening of the Hollywood Bowl and the upcoming Fourth of July holiday, it marked the true start of summer. But a couple of years back Wimbledon coverage moved to ESPN and being an annual tennis fan, the kind of person who watches Wimbledon and the French Open and forgets about Serena and Rafael Nadal and Roger Federer until next year, it's catch as catch can now. But I remembered this week that it was tennis time again, that the green grass courts of Wimbledon, England's revered tennis tournament, would be mowed and ready. Going to my friend Big Brother Google I learned that Wimbledon began on June 29th and runs through July 12. Wimbledon even has its own website where you can catch up on scores, see who's playing next and where, tune into radio and video goodies, check out their A to Z (pronounce it Zed, please) guide and courtesy of Jaguar, FEEL Wimbledon for yourself. I've only missed four days; there's still plenty of time to find the sweet spot. Find out just who this dreadlocks-wearing Dustin Brown is. Maybe I'll even dig out one of the handful of racquets clogging up my hall closet. I always did like wearing white in the summer. I remember Breakfast at Wimbledon! I used to eat strawberries and cream for breakfast -- or the closest I could manage which was usually Cool Whip rather than anything that the British would recognize as cream. Cool Whip was my cup of tea too. If you know what I mean.